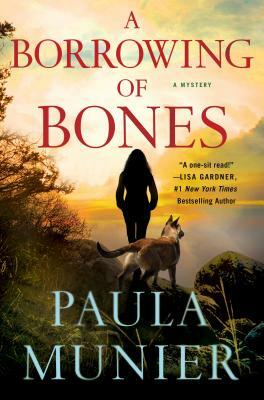 The first in a gripping new series by Paula Munier, A Borrowing of Bones is full of complex twists, introducing a wonderful new voice for mystery readers and dog lovers. Together the two former military police—one twenty-nine-year-old two-legged female with wounds deeper than skin and one handsome five-year-old four-legged Malinois with canine PTSD—march off their grief mile after mile in the beautiful remote Vermont wilderness. Even on the Fourth of July weekend, when all of Northshire celebrates with fun and frolic and fireworks, it’s just another walk in the woods for Mercy and Elvis—until the dog alerts to explosives and they find a squalling baby abandoned near a shallow grave filled with what appear to be human bones. Paula Munier is the author of the bestselling Plot Perfect, The Writer’s Guide to Beginnings, Writing with Quiet Hands, and Fixing Freddie: A True Story of a Boy, a Mom, and a Very, Very Bad Beagle. She was inspired to write A Borrowing of Bones by the hero working dogs she met through MissionK9Rescue, her own Newfoundland retriever mix rescue Bear, and a lifelong passion for crime fiction. She lives in New Hampshire with her family, Bear, and a torbie tabby named Ursula.